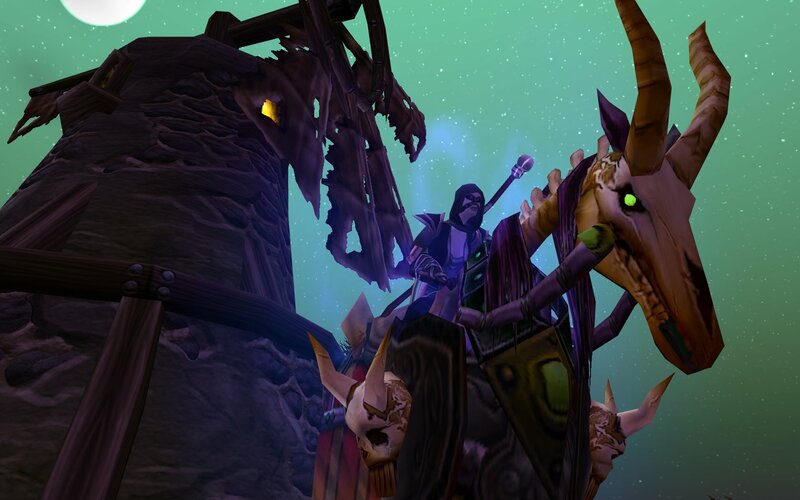 Amijade – your self-taught and self-proclaimed Dark Arts Motivational Speaker (a.k.a., The Duchess of Death), can be found on the US-Earthen Ring server as proud member of The Forsaken. She has earned a Master’s Degree in Alchemy from the Royal Apothecary Society of Undercity and green-thumb (literally) from her side full-time job hobby of picking flowers. In her spare time, she can be found reading everything in sight, or fishing for Twilight Guppies in the northwestern parts of Twilight Highlands. She doesn’t cook because it’s both beneath her and something a mage would do. She’s a faithful and dutiful member of the Alea Iacta Est – Verendus guild, and is a huge fan of all things warlockery and warlock-y. Currently, she runs with both Affliction and Destruction specializations depending on her foul mood and how she prefers to have her victims suffer. I should be on my Dreadsteed but it just was too bright for the picture and sadly it took away from the windmill. I’ve been a WoW player since Vanilla and I currently run with three toons: my hunter, my lock and my shaman. Sadly, warlocking has taken a back to seat to healing for my raid team so my ‘lock is on the sidelines for now; however, she’s still my favorite toon to play. I love to heal on my shaman and there’s nothing as fun as camping a rare pet or kiting an enemy on my hunter, but warlocks have always had a soft spot in my heart. To me, warlocks are a great class despite their ping-pong in popularity and with all the buffs & nerfs they have experienced over the years. Like many warlocks, I still leave a candle at the vigil for “Drain Mana” and my cold heart yearns for “Drain Tanking” to come back. I became hooked on my warlock the first time I ran her in WSG. I kept running into a very annoying mage and for some reason he would always just try to just kill me and no one else. Jealousy? Well, I am a warlock and an imposing, fearsome figure to meet so I can only assume jealousy was the reason. Between my DoTs, slowly poking him with my dagger and my cute little Felpuppy chomping on him from behind (and on his behind) this poor player never stood a chance at surviving. Muahahahaha! It was so much fun! I filled my entire bag with his soulshards that day and how can you not love that? Why am I starting this blog? For fun? For glory? To rule the world? Well, I don’t see myself becoming famous writing a warlock WoW blog anytime soon. So, my only guess would be I’m simply enjoying the journey of learning about blogging and relaxing by writing. My inspiration came from having read great blog authors over the years and from listening to The Twisted Nether Blogcast. I highly recommend you find time to go visit the TNB, and start clicking around and begin reading whatever sparks your curiosity. You won’t regret it. Whether this blog turns out as a fail or a win, I’ll take my chances and cast the dice anyway. I am very new to blogging and I’m far from a good writer. So please, be kind and keep that in mind. Blogging and writing is a learning process for me and I do plan to get better. It may take me a while to find my inner-writing voice and what I truly want to say. Hopefully, it’ll get better and you’ll want to come back. I plan to start posting pictures as well, once I find a decent program for cropping and enhancing images. If you find a spelling or grammar mistake please call me out on it. Often, it is only through our mistakes that one can licit great wisdom. So any help in matters of better grammar is welcome. Love me or hate me…thanks for reading!